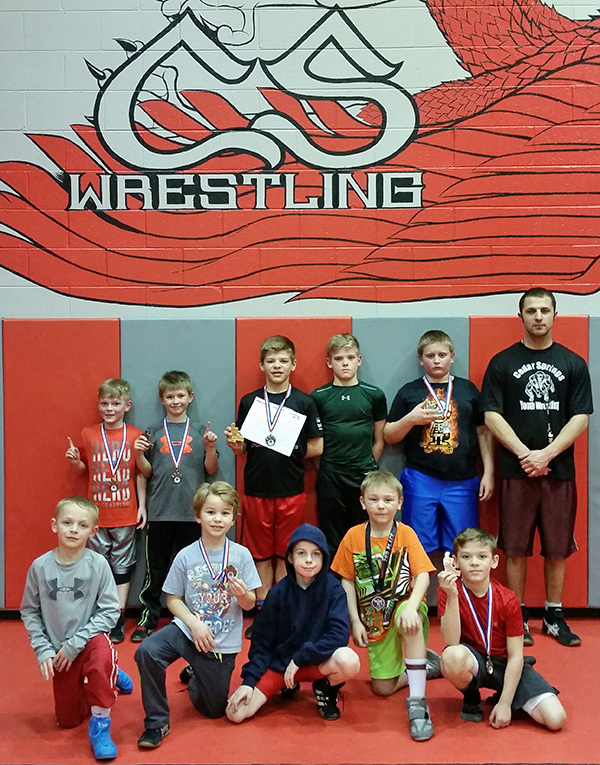 Cedar Springs Youth wrestlers show off their medals. Photo courtesy of Terry Troupe. CSYWC traveled to Grandville HS Sunday January 7th to compete in the first MYWAY Open and Novice tournament of the new year in the West Region. We brought 26 grapplers to compete alongside 630 others. Five wrestlers competed for the first time this season and two—Kaiden Dreyer and Joseph Reynhout—competed in their first ever matches. The team finished 6th in Most Pins with 21 in 30:45, and 10th in Total Match Points with 279, ending the day 44-48. Spencer Schoenborn topped the day off taking 1st in Most Pins in the Least Time with 5 pins in 7:44. Zach Vu had 3 in 2:55 taking the 27th spot, Rory Schoenborn was 38th with 3 in 5:27, Blake Falan was 57th with 2 in :48, Alex Hanes took the 70th spot with 2 in 1:23. Carter Falan had the Fastest Tech for the team and was 21st overall with 2:52. Zach Vu had the 4th overall fastest pin for the day with :09! His second fastest pin was :17, tying for 21st. Blake Falan tied for 33rd with :20, Rory Schoenborn was 39th with :22 and Alex Hanes had the 100th fastest with :34. Spencer Schoenborn scored the most team points with 22, tying for 29th overall. Carter Falan had 21.5, Zach Vu had 20, Alex Hanes scored 15 and Rory Shoenborn scored 14. Karsen Roelofs scored the most single match points for the team with 18-11th overall (35 points for the day), Kaiden Dreyer (31 total) and Carter Falan (24 total) tied for 55th with 15 points. Taking the 4th place medals was Jaxon Fitzgerald, Rory Schoenborn, Blake Falan, Gavyn Byxbe and Gabe Gair. Finishing 3rd was Brycen Alber, Alex Hanes and Spencer Schoenborn. 2nd place medalists were Ben Streeter and Maston Wood. Our 1st place Champions were Zach Vu, Jon Libera and Carter Falan. Next week the team will compete at Kent City and Central Montcalm. 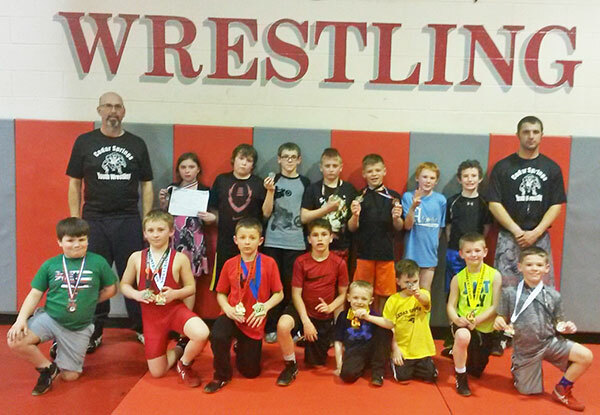 Twenty-three Cedar Springs Youth wrestlers competed alongside 107 other teams last weekend for the final regular season and last MYWAY Greights competition. Almost 700 grapplers competed for the final piece of this year’s Greights medal and a chance to be Champion for the last West Region regular season tournament. CSYWC finished 10th in match points with 188. Deegan pike scored 31, Wyatt Dickinson, 20; Chasyn Winchel & Wyatt Cooper, 19; Carter Falan, 16; Tucker Crystal, 13; Bllake Falan & Cade Troupe each scored 9, David DeWeese and Bryson Streeter each scored 7, Logan Troupe, 6; Daniel Vaughn, Remington DeWeese, and William Dickinson, 5; Matthew Vaughn & Landen Totten, 4; Hudson Crystal, Gavyn Byxbe & Dakota Winchel scored 2 each. We finished the day 37-35 and 7th in pins with 17 in 25:51. Wyatt Cooper came in 25th over all and first on the team with 3 pins in 4:11. David DeWeese was 51st over all and 2nd on the team with 2 in :40. He also had the 4th fastest pin of the day in :13! Awesome job, David! Wyatt Dickinson tied for 12th in most single match points with 18. Deegan Pike had the most match points for the day and tied for 40th over all with 31. David DeWeese had the top fastest pins for the team with :13 and :27, William Dickinson was 3rd with :34, Landen Totten was 4th with :40 and Wyatt Cooper was 5th with :41. In the 2008-2012 Girls division, 40lb class Sierra Streeter placed 2nd after 2 matches. In the 2002-2004 Girls division, 122lb class Ashly Erxleben placed 1st after 2 matches. In the 2010-2012 All division, 52lb class Tucker Crystal placed 4th after 4 matches. In the 58lb class Chasyn Winchel placed 2nd after 4 matches. In the 2008-2009 Open division, 64lb class Blake Falan placed 3rd after 3 matches. In the 72lb class Jonathan Libera placed 3rd after 2 matches. In the Novice division, 52lb class Caden Troupe placed 4th after 3 matches. In the 58lb class Deegan Pike placed 3rd after 4 matches. In the 2006-2007 Open division, 100lb class Matthew Vaughn placed 2nd after 2 matches. In the 150lb class Wyatt Cooper placed 2nd after 4 matches. In the Novice division, 130lb class David DeWeese placed 1st after 2 matches. In the 2004-2005 Open division, 105lb class Carter Falan placed 1st after 3 matches. In the 2002-2003 Open division, 195lb class Landen Totten placed 1st after 2 matches. 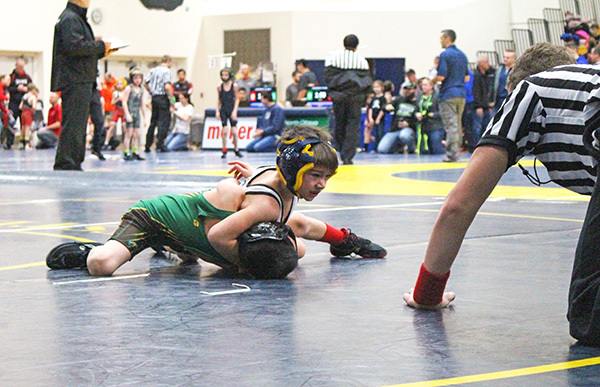 Nineteen CS Youth wrestlers and their families joined 419 other grapplers at Grand Haven High School Sunday, January 29, for the weekly MYWAY West Region tournament, with 16 placing in the top four of their weight class. “Sunday’s results are a testament to how hard these kids are working in practice. A special shout out to Chasyn Winchel & David DeWeese, taking 1st place in their weight classes for the very first time! Congratulations boys!” said Coach Bryan Goike. The team had 16 pins and tech falls in a total time of 21:45; 188 match points for the day; and tied for 10th place over all with Mona Shores. They finished the day with 27W-30L. Trevor Marsman had the most match points for the team with 34. Carter Falan had 22. Jonathan Libera had 20. Andrew VanGessel had 17. Hudson Crystal had 16. Ben Brunner had 15. Blake Falan had 13. Benjamin Streeter had 10. In the 2010-2012 Open division, 49lb class Bryson Streeter 4th place after 4 matches. In the 52lb class Tucker Crystal placed 1st after 2 matches. In the 55lb class Chasyn Winchel placed 1st after 2 matches. In the 55lb class Jayden Mull placed 3rd after 2 matches. In the 58lb class Ben Streeter placed 4th after 3 matches. In the 2008-2009 Open division, 64lb class Blake Falan placed 3rd after 4 matches. In the 72lb class Jonathan Libera placed 2nd after 4 matches. In the 2006-2007 Novice division, 110lb class Dakota Winchel placed 1st after 2 matches. In the 150lb class David DeWeese placed 1st after 2 matches. In the Open division, 80lb class Hudson Crystal placed 3rd after 4 matches. In the 150lb class Wyatt Cooper placed 2nd after 2 matches. In the 2004-2005 Novice division, 100lb class Ben Brunner placed 2nd after 2 matches. In the Open division, 105lb class Carter Falan placed 1st after 4 matches. In the 2002-2003 Open division, 85lb class Trevor Marsman placed 1st after 3 matches. In the 100lb class Andrew VanGessel placed 2nd after 4 matches. WMP wrestler Aaiden Vasquez who bumped up a weight class in order to have some mat time. Photo by B. Chong. 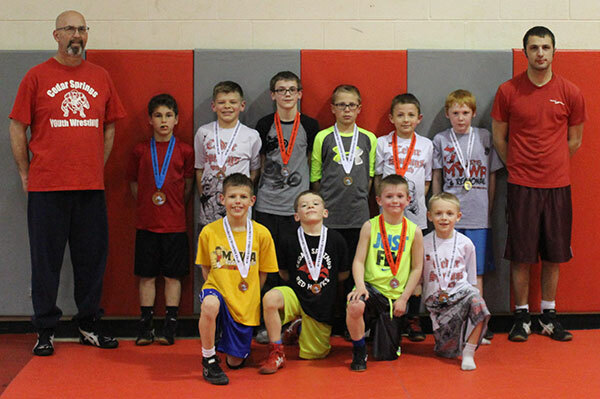 West Michigan Pursuit had a busy weekend of wrestling traveling to Grand Haven, Ithaca and South Dakota. 62 lb Drew Moro entered the Buffalo Nationals–Midwest Tour in South Dakota. He battled into the Championship and lost by 2 points, finishing in 2nd Place. WMP had 5 grapplers enter the MYWAY Greights North tournament in Ithaca and 3 finished in the top four. 80 lb Blake Peasley, 9/10 age group finished 4th place due to an injury default. 155 lb Aidan Dowdell, 13/15 age group finished 2nd Place. 59 lb Landon Foss, 9/10 age group claimed the Championship title. WMP had 14 grapplers enter the Grand Haven tournament and placed 12 in the top four. 80 lb Blake Hammer, 11/12 age group; 55/59 lb Mason Hendrick, 9/10 age group and 80 lb Isaiah Smith, 9/10 age group finished 4th Place. 52/55 lb Kaleb Pautke, 7/8 age group and 75 lb Isaiah Sostenes, 9/10 age group finished 3rdPlace. 61 lb Selina Stalker, 4/6 age group and 52/55 lb Aaiden Vasquez, 7/8 age group finished 2nd Place. 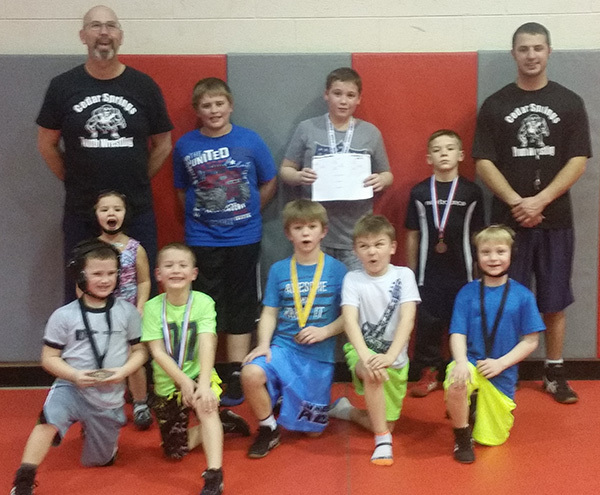 64 lb Quinten Cassiday, 7/8 age group; 67 lb Chayson Eberspeaker, 7/8 age group; 55/59 lb Josh Vasquez, 9/10 age group; 49 lb Blake Werkema, 4/6 age group and 158 lb Maston Wood, 11/12 age group all claimed Championship titles. “Often the focus is put on whether you win or lose; I believe that it is everything leading up to that point. How you conduct yourself is just as important, that response is what makes a Champion,” said Head Coach, Dave Andrus. Results from Battle on the Eve, Great Lakes Championship, Grandville, Big Rapids and Otsego. Josh Vasquez earned a Championship title in the 55/59 lb, 9/10 age group at Grandville, last weekend. Photo by Melissa Egan. 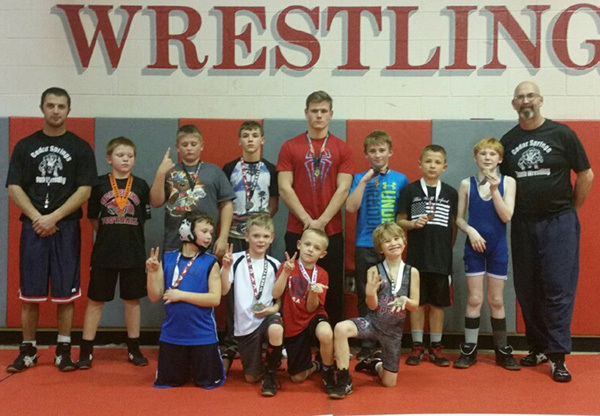 West Michigan Pursuit has had a busy schedule of wrestling. Drew Moro traveled to Missouri for the Battle on the Eve, December 31. He competed in the 8 and under age group/60 lb weight class. Drew went undefeated, 4-0 and took the Championship Title. 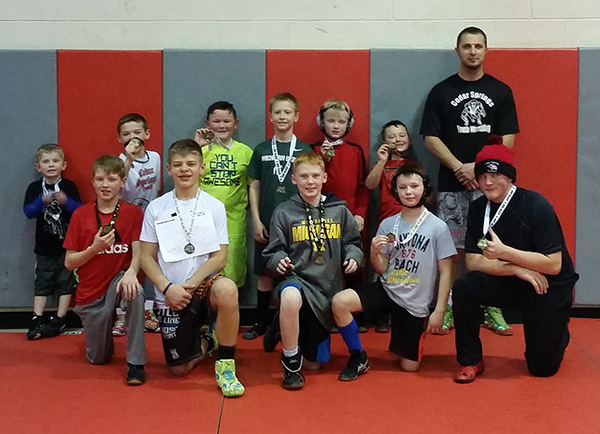 Friday, January 6, seven grapplers traveled to Indiana for the Great Lakes Championship. Competitors from California to Pennsylvania came to compete in this tough tournament. 14U, 143 lb Aaiden Dowdell finished 7thPlace; 10U, 58 lb Josh Vasquez, finished 8th Place, and 80 lb Blake Peasley finished 7th Place; 8U, 58 lb Drew Moro finished 6th Place, and 72 lb Tyler Parmeter finished 8th Place. Sunday, January 8, the team split to compete at Grandville, Big Rapids and Otsego. Blake Peasley entered the MYWAY Greights tournament in Otsego. He went undefeated, 4-0 taking the Championship Title in the 80 lb wt class/ 9/10 age group. WMP entered 6 grapplers at the Big Rapids trophy tournament. The 2 foot tall trophies attracted several tough competitors. 52 lb Kaleb Pautke took 3rd Place in the 9/10 age group. 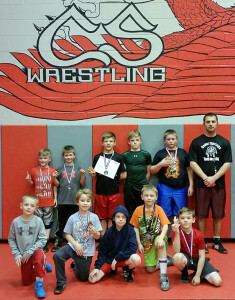 Taking home Championship titles were 64 lb Quinten Cassiday, 7/8 age group; 67 lb Chayson Eberspeaker, 7/8 age group; 55 lb Kellen Weckesser, 7/8 age group, and 49 lb Blake Werkema, 4/6 age group. 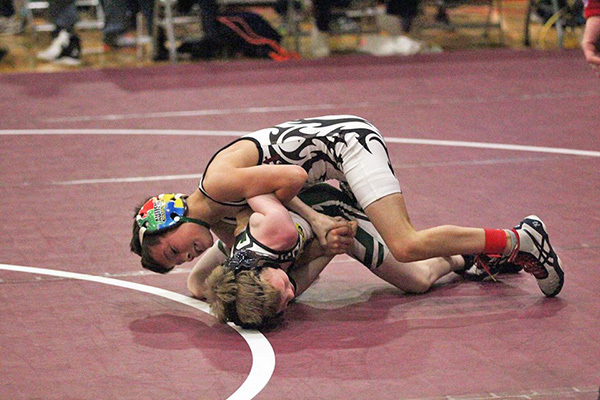 The West Region tournament was held at Grandville where eight WMP grapplers entered to compete. 55/59 lb Landon Foss, 9/10 age group and 55 lb Aaiden Vasquez, 7/8 age group finished 2nd Place. Those taking home Championship titles included 63 lb Luke Egan, 9/10 age group; 61/64 lb Drew Moro, 7/8 age group; 67/72 lb Tyler Parmeter, 7/8 age group; 71 lb Isaiah Sostenes, 9/10 age group and 55/59 lb Josh Vasquez, 9/10 age group. “After a difficult start to the weekend with Great Lakes Nationals, I was very impressed how they refocused and dominated on Sunday,” said Head Coach Dave Andrus. Despite the bad weather on Sunday, December 11, 16 wrestlers competed in the second MYWAY West tournament at Lakewood High School. Of the 16, 13 brought home medals. Placing 1st were Landon Totten in the 03-02 195lb Open division, Logan Troupe in the 05-04 100lb Open division, Wyatt Cooper in the 07-06 150lb Open division & Luke Ball in the 12-10 HWT Open division. Placing 2nd were Trevor Marsman in the 03-02 85lb Open Division, Andrew VanGessel in the 03-02 95lb Open division, Hudson Crystal in the 07-06 85lb Open division, Caleigh Wood in the 09-08 49lb Open division, Deegan Pike in the 09-08 55lb Novice division and Tucker Crystal in the 12-10 52lb Open division. Placing 3rd was Gavyn Byxbe in the 07-06 75lb Open division. Placing 4th were Annabelle Wood in the 05-04 95lb Novice division, Thomas Prins in the 07-06 90lb Novice division and Caden Troupe in the 09-08 52lb Novice division. A special mention needs to be made to Jayce Karafa. He took 3rd place in the 58lb Novice division at Kentwood on 12/4/16. It was his first tournament. 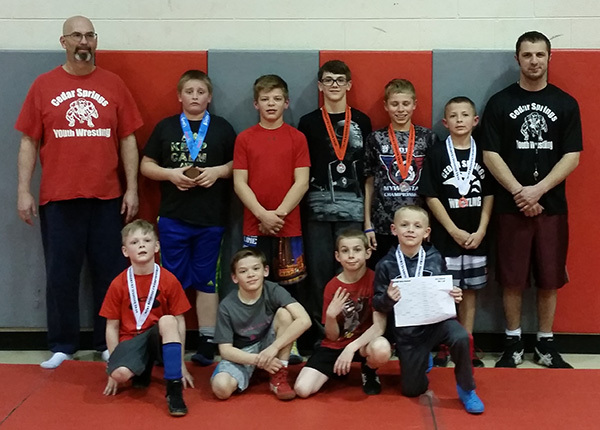 Cedar Springs Youth Wrestling Club traveled to Brighton, Fremont, Carson City and Ann Arbor last weekend to compete in several tournaments marking the end of the regular season. Twenty-two wrestlers, several coaches and their families represented our community with great sportsmanship. As they head into the MYWAY Regional Championships at Northview High School March 19-20, their hard work and dedication will determine whether they qualify for the State Championship in Battle Creek on April 3. If you see them in school or around town give them a high five and tell them congratulations on a hard fought, respectable season. Two wrestlers traveled to Brighton High School for the Border Wars Monster Medal Tournament. Hudson Crystal placed 3rd in the 72lb 08-07 Open division. His fastest tech fall was 2:10, 3rd fastest in his age bracket and 11th over all. He qualified for the 2016 Border Wars Folkstyle Nationals at the Kellogg Arena! They finished their day with 5 wins-3 losses. Ten wrestlers traveled to Fremont High School. Carter Falan finished 4th, David DeWeese finished 3rd, Brandson Wood and Blake Pickard finished 2nd. Dakota Winchel and Annabelle Wood were our first place Champions! They finished the day with 14 wins-18 losses and had 7 pins in a total time of 12:27. Carter Falan had 2 pins in a total time of 2:30, the fastest one for the team being :39. Chasyn Winchel had the fastest technical fall in 2 minutes. Five wrestlers traveled to Carson City High School. Placing 4th were Gavyn Byxbe and Wyatt Cooper, placing 2nd were Benjamin Streeter and Andrew VanGessel. They finished the day with 5 wins-11 losses. Andrew VanGessel had the fastest pin for the team. Gavyn Byxbe had the most matches for the day with 4. 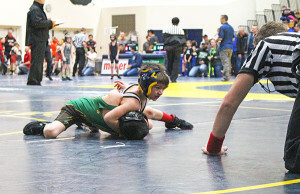 Seven wrestlers and their families traveled to Saline High School to participate in the Saline Novice Championship alongside 450 other grapplers in 59 divisions. Tucker Crystal placed 4th, Jonathan Libera placed 3rd, Blake Falan, Logan Troupe & Ariana Meyers placed 2nd and our 1st place Champion was Hudson Crystal! Ariana Meyers had 3 pins in a total time of 3:22 and the fastest pin for the team at :26. They finished the day 28-9, 9th place out of 92 teams from all over the state!